A Hand-Held Tool For Sweeping, Scrubbing, Drying, Grooming and More. Perfect for pet lovers, but ideal for anyone else too. It's like a mini version of the popular broom, and it provides incredible power and versatility in a hand-held package. Use it to gently groom any animal, remove fur and grime from furniture, sweep small areas, scrub surfaces, eliminate moisture, clean pet hair from carpeted stairs, and so much more. It's made from one solid piece of molded rubber, and it has a hidden metal core to make it more rigid and durable. There's a large patch of flexible rubber bristles that do most of the work, but a full rubber blade along the side adds additional functionality. The integrated handle provides a comfortable grip, and the tapered top allows you to get into corners easily. When you sweep or scrub using this tool, the bristles will conform to any surface, and they will form a solid wall so fine particles don't get left behind. As you work, a slight charge will build to ease the collection process, and pull debris from deep down. It's safe for use on any material, and it's not affected by harsh chemicals like bleach. When it gets dirty, simply rinse, hand wash, or place in the dishwasher to clean it. Powerful. Incredible cleaning ability in a compact package. Other hand-held sweeping tools glide over the dirt, or spread it around. This one effectively collects every last bit with far less effort. Versatile. Use it as a regular sweeper alone, or take advantage of it's full potential to tackle other jobs too. Scrub floors, wash windows, groom your dog, clean your car and more. Washable. Unlike other tools that can be difficult to clean, this brush washes easily. The rubber bristles can be cleaned with soap and water or anything else to remove yucky build up and rejuvenate the tool. Durable. Practically indestructible, you'll never have to worry about this tool falling apart. It will provide long lasting performance, and it will work like new for years. Indoors or Out. Other brushes can't be used outside due to the materials used, or the overall quality. Not only are the bristles adaptable for outdoor cleaning, they are also durable enough to hold up to commercial style cleaning of any surface outside. Squeegee Blade. An added bonus, the flexible squeegee blade can sweep up fine, dusty particles, eliminate moisture from windows, or dry floors after you scrub them. Safe. Although the brush is tough enough to clean any grime, it's also gentle on any surface, so you never have to worry about scratches or other marks when cleaning with it. Long Lasting. Even with regular use, the bristles will never break or bend, and the brush will never lose shape or wear out. Static Charge. As you work, a slight charge will build to pull up hair and other light particles, and prevent them from flying around. Flexible. Totally bendable, this brush will conform to uneven surfaces, and get down into grout lines to clean every piece of dirt without trouble. Gentle. 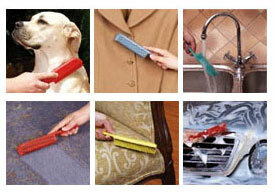 For cleaning delicate surfaces, or for grooming sensitive pets, this is important. It actually massages as you groom, so pets that have problems with other tools often prefer this brush. When using for cleaning, you never have to worry about any harm to the object or surface you are working with. Grooming & Cleaning - You can’t stop your pet from shedding, but you can clean up hair instantly with the Sweepa Rubber Brush. Keep your furniture, carpets and pets looking good with less effort. It's the ultimate fur remover and cleaning accessory, and nothing works better to clean pet hair from furniture and upholstery. Use it on pets to brush away loose hair, or scrub away stubborn dirt. Use it to clean up after them by scrubbing dirty paw prints from floors, removing fur from stairs, or giving a quick clean up to their bed or yours. Scrubbing - Wash bugs off your car, clean muddy floors, give your pet a thorough bath, clean your boat, eliminate grime from vinyl siding and so much more. As a scrubbing tool, this brush is pretty amazing. It can handle any type of soap you want to use, and the flexible material offers plenty of power without any risk to the surface you're cleaning. Drying - Once you finish washing something, flip the brush and use the blade to dry the area completely. The rubber edge works just like a professional squeegee to eliminate moisture and leave no spots or streaks. It's perfect for windows and mirrors, but you can also use it to move water from flooded surfaces like counters and floors. Use a single pass to remove all water. Sweeping - Use it to clean small areas of flooring, or for isolated messes. It's also nice for moving debris swept up by a larger broom, and collecting it in a dust pan. Other tools require multiple passes to collect the same amount of debris, and most will leave behind particles no matter how hard you try. When sweeping with this tool, every last spec is picked up with a single pass in most cases. Lint & Fur Removal - Use on your clothing, or use it on the seats of your car. This tool makes one of the best lint and hair removers available because it allows for fast and thorough results. The pliable bristles dig deep into the upholstery, and the angled head allows you to reach into the cracks. Quickly collect fuzzy stuff into a neat pile, and then eliminate it without effort. Stop buying a new brush year after year, and get one that lasts. This powerful tool will outperform the competition when compared for cleaning ability, and it will last way longer too. It makes everyday cleaning so much easier, plus it allows you to do other jobs that nylon brushes and regular pet combs can't handle. The natural rubber bristles will never scratch, but they will flex to form a wall in order to collect fine dust particles, and leave surfaces spotless. It has a total of 175 rubber bristles that are attracted to pet hair and other tough-to-clean dirt. Unlike other tools, the static charge built by this brush actually pulls hair and other debris toward you, making it easy to clean. Thanks to high quality materials and a superior design, the Sweepa Rubber Brush will work incredibly well, and remain useful for many years, even with regular use. 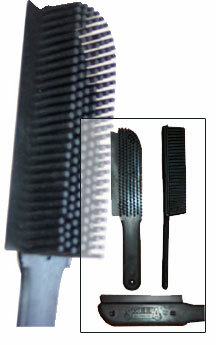 Dimensions 10" x 2" x 1.25"
Head Size 5.5" x 1.5" x 1.25"
Uses A dual purpose tool for cleaning and grooming. Sweep debris, groom fur, scrub surfaces, bathe a pet, dry windows, clean upholstery and more. Safe for all surfaces, and effective in cleaning up almost any type of dirt. Color Varies. For specific choices please use the comments box at checkout. Inner Core Yes. Added metal core for shape and durability. Compatibility Safe for any surface or object. A powerful cleaning tool with a multitude of uses. Add to your cleaning arsenal to improve the end result, and make your life easier. Pets with sensitive skin love it for grooming, pet owners love how it eliminates fur, and those without pets enjoy the convenience and effectiveness it offers when cleaning up all sorts of messes. Order Yours Today! Best thing I've ever used to clean pet hair from furniture and stairway carpet. The brush was OK but it was too rubbery to use with any force. I didn't care for the side flap that I guess could be used for wiping liquids from a window you were washing. The flap, again, was too rubbery for that kind of job. And it got in the way when you were using the brush. I have tried so many different ways to remove the dog hair from my car, which has neoprene upholstery, this is the first thing that has actually worked. It is also saving our family a ton of money in lint removers for our clothes and furniture. I bought the brush to use on pet hair. Very pleased how easily it takes hair off the furniture. Well worth it. These do work nicely, really good product, gave them to a couple of friends and they agree. This is the only tool you need to get hair and lint off! I have a Sweepa Rubber Brush already. I like it so I ordered three more for the pet owners in my family. I did not realize that this brush is so versatile. I am pleased with my purchase. I was using a sticky roll to remove cat hair from my black wool coat, but this item works much better and is easier to handle. The best way to use it is to lay the coat on a flat surface and do vertical strokes. I love my Lab, Lady, more than words but her shedding white hair is relentless! I had one of these brushes from years ago and used it to loosen the hair in my rug so it would vacuum. Worked great. I use either side depending on the rug. I use this in my car and it really loosens it up. I bought 7 this year and gave them to fellow dog owners. I live the brush but have to say the newer ones aren’t as sturdy as my old one. Still, for the price it’s a must have. My friends cats Love it! Seems to be a favorite with our cats. I have a dog that should live in Alaska instead of the hot south. His fur has a very fine THICK undercoat each spring. He sheds constantly. I have tried everything from wire brushes to flea combs, but both hurt him. This rubber brush though removes the hair without pain. I rub him back and forth, and the hair is removed very quickly and easily. He stands there and turns any area to me to work on. Be advised though I take him outside because it looks like it's "snowing" as the hair blows away with the breeze. Birds and squirrels love his white winter fir, recycle his fir building their nests. Stay warm baby critters and stay cool my precious puppy. I have given a few as gifts. All reports and my own show excellent results with dog hair. I had one of these years ago for removing dog hair. I gave it to my daughter who came to visit from Colorado with her two dogs. Her car was a mess. I was so glad to find these and I love them. Have used it for removing cat hairs from clothes and carpeted stairway. No reason not to use it anywhere an ordinary brush is used (except a hairbrush, although I haven't tried it for that yet). Just rinse out to clean. I totally loved the Sweepa Rubber Brush. Not only does it pick up the hair in my carpet, I am able to sweep a lot better the rest of the apartment. I totally recommend it. I can't believe how fast I received my rubber brush. I am completely satisfied with it. This is great for cleaning small areas. Bought my first one at Walmart. Went online for the second! Am considering sending one as a gift to someone whose furniture is always full of dog hair. Doesn't snag the upholstery, no sticky tape or residue, just gets the dust, dirt and hair off the furniture! I really am pleased with these brushes. They sent me a pink one and a blue one, and they are very colorful. I use one to sweep small areas of my living room carpet, (cat and dog, both have long fur and shed) and one to brush my cat. She never has liked being brushed, and is still funny about it, but I noticed she lets me stroke her with it longer than any of the other brushes I've tried using on her. I would recommend the Sweepa rubber brushes to anyone. Don't care for the brush at all! overpriced also! I just bought a Sweepa pet brush--my third, but one of many I will be buying for many years to come. This brush is inexpensive, but this company's service is impeccable. And the two identical brushes which I have used for more than 10 years are still AS IF BRAND-NEW. I brush my cats with them. I brush my furniture with them. I use them often daily. They are VERY easy to remove fur and hair and lint from; and--unlike any other brushes I've ever bought, for WHATEVER price--the brushes never wear at all. This is the best pet/furniture brush on the market. Thank you for this product, Sweepa--and for your ethics in not pricing it higher. absolutly the best rubber brush only Brush I can groom my greyhound with,she loves it excellent for her coat,only brush that dosen`t hurt her,very thin skinned.also use it on the main and tail of my horse,dosn`t damage the mane or tale love this flexable rubber,ordered another one love it so much great purchase. I tried out the brush and am pretty happy with the results. Kitty cat tumble weeds don't stand a chance against these brushes which are slim enough to get behind and under tight spaces. At their reasonable price I bought two, one for the floor and one for furniture. Also pretty good at sweeping up cat litter. I love this brush for brushing dog fur and dirt off off furniture. This is also great for getting fur and hair off of coats and other clothing. The possibilities though are endless. I am enjoying this product. It doesn't work as a brush for my cats but does work very well on the places they sleep. Love this brush! I use it for carpet, especially steps and places that are hard to reach. I don't have pets, but I do have crumbs on my tablecloth...I also luv being able to throw it in the dishwasher. This is my third brush, the first two were permanently "borrowed" by my children who found their own uses for this great brush. I have 4 dogs and 3 cats. You need this hair removing brush. Aspechaly if your fer kids get on your furniture. Great brush! Have used it on clothing for cleaning off pet hair and also in the car. Greatly impressed! Oh my gosh - my cats go nuts for this brush. They just love it - they roll and stretch out and ask for more. I've always brushed my cats but have never had them "beg" for bushing. This thing in amazing. And not only that - it picks up more loose hair than anything I've ever seen. Worth every single penny. Fast shipping too! I bought a similar brush to this years ago and when it went missing recently I went looking for another one. This brush does exactly what it promises to do, I use it in every carpeted room of my house, I love how it does the edges between the wall and carpet and doesn't tear up carpet. I would recommend this brush to anyone with pets. An excellent product that we purchased as a replacement of one that we lost. It does exactly as it states. I bought this brush to clean pet hair off of evrything. And it wokred. I would have hair on my clothes, sofa, andwhere i carried from my house to my car. And the pet brush did a good job cleaning it all up. Best thing I've ever used to clean pet hair from furniture and stairway carpet. I haven't tryed in ON the animals themselves, but it WAY outcleans their hair off my furniture and I've tryed all the new fangled items. This one is the one to get!! Most of our products are pretty difficult to find locally. This one in particular may not be carried by stores local to you. Luckily, our shipping cost for this product is low, and the speed is fast. 5 of 9 Customer(s) found this Answer helpful. Can this be used to clean shower walls? Broom & Brush Combo - Get this brush along with a broom, and save money! 12" Rubber Broom - The original tool. For full size cleaning of floors and large surfaces. Easily Remove Lint, Dust, Dirt, Hair and More. A Hand Held Sweeping Tool For Life's Little Messes! Two types of bristles in one! This versatile tool is ideal for any pet owner because it works great for grooming and cleaning. Professional Level Durability And Results. Keep Dirt Running Scared. Incredible Cleaning Power, Durable Bristles And A Perfectly Angled Handle. Lightweight and Comfortable. Works With Brooms, Mops, Brushes, Dusters and More. More bristles, and a curving head provide incredible cleaning power. For professional looking results on grout and tile.